Although, Vijay Govindarajan talks about the strategic innovation in all big companies such as GE, IBM, P&G and considers Google, Amazon and E-bay as the fillers that came into existence because rise of internet and lack of innovation in existing players, the question for us is what AEC industry can learn from his work? 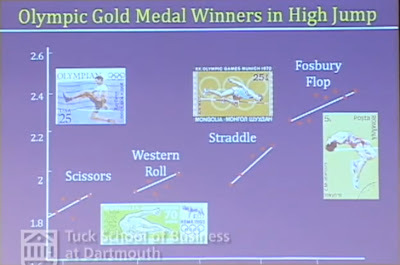 The following graph shows the four different High Jump Styles (business models) used by Olympic Gold Medal winners in last 100 years. The most interesting fact is that all new Hight Jump Styles were invented by new athletes and not the existing high performers - meaning athletes expert in "Scissors" did not invent "Western Roll" and so on. One of the reasons for failure was that "Scissors" needs the exercise of different muscles than "Western Roll." For AEC industry, building Lean and Green using BIM and IPD need exercising different muscles (skill sets) than the traditional way of doing things. If we compare the High Jump Style (business model) innovation explained above with the business models that successful AEC firms are using today, then we come to the conclusion that new innovations will belong to new players in the industry. Interestingly, it is not very strait forward. Companies with a strategy for innovation, that takes into consideration all three boxes shown in the figure-1 above, could still lead in the future. The solution Vijay Govindarajan presents in his book is "Forget-Borrow-Learn." That is, companies need to forget the rules of the core business, borrow selectively from the existing business model and learn to operate in new entrepreneurial space. These corner stones of strategic innovation are equally true for AEC firms. Adopting new ideas, business practices and technologies (BIM, Lean, Green and IPD) require a little more attention than the attention given to the core business (the performance engines) but these companies need to develop the 'Innovation Execution Teams' for future competition along with maintaining the present competition.